These cymbals are specially designed for small hands as well as for children. Also great for practicing when you don't want to make too much noise! 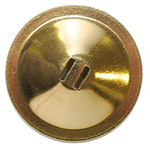 Made of solid brass with double slots and are 1.75 inches diameter. Approximate weight 75 grams (2.65 oz). Each set contains 4 (four) cymbals and heavy duty elastic. Beautiful zils! I have small hands and it's so nice to have zils I can control. Lovely light sound, too. Just received this item, and very pleased with the size, sound, and price. Since I'm recovering from a hand injury, these zills are light and easy to use, and will be perfect for class. I plan to recommend them for new students..thanks! 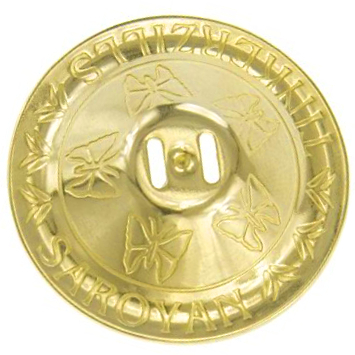 Saroyan are by far the best! The Tinkerzills are wonderful for my young students & smaller ladies with petite hands. The sound resonates beautifully. The are fun to play even if you do have larger hands, as the sound is "delicate" and also great for someone with carpal tunnel or arthritis...since these are small and light. Highly recommend these zills. These are perfect little zils! They have a very nice sound, they have a good 'ring' to them. I bought them because I wanted something less clangy than my other larger zils. I think these are going to be more pleasant for the audience members if you're in a smaller space and the audience is up close. They're very fun to play!